With the temps getting warmer and the sun staying out a little later, I can't help but want to dine "en plein air" (alfresco) all the time. We've started dressing up our deck (more on that later!) and have been using it as much as we can. This time two years ago, we were basking in the sun in Nice, France and have been reminded of those times because of the way the weather here has been mimicking the weather in Nice. Which brings me to this little outdoor entertaining board. Serena & Lily have two lines, the Monaco and the Riviera Collection and they both make me want to fly back to Nice asap. 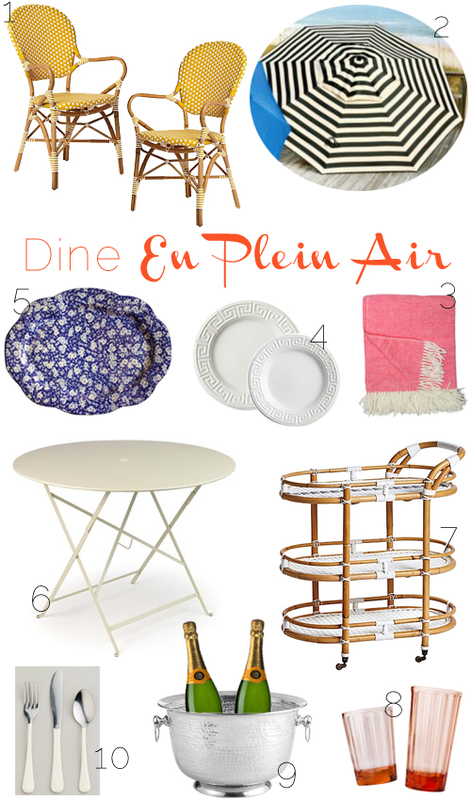 Both collections inspired me so much that I wanted to create my dream Riviera Style outdoor entertaining board. Hope it inspires you to dine En Plein Air! I'll be at High Point Market this weekend with my good friend Jojo from Cline Rose so make sure to check out my Instagram account to see what goodies we're finding. Love this outdoor collection! Have a great time at High Point, can't wait to see the goodies! Safe travels.